Time based Key Performance Indicators provide significant insight to how quickly your organization responds to the needs of internal and external customers. They tell a story that every leader needs to pay attention to. 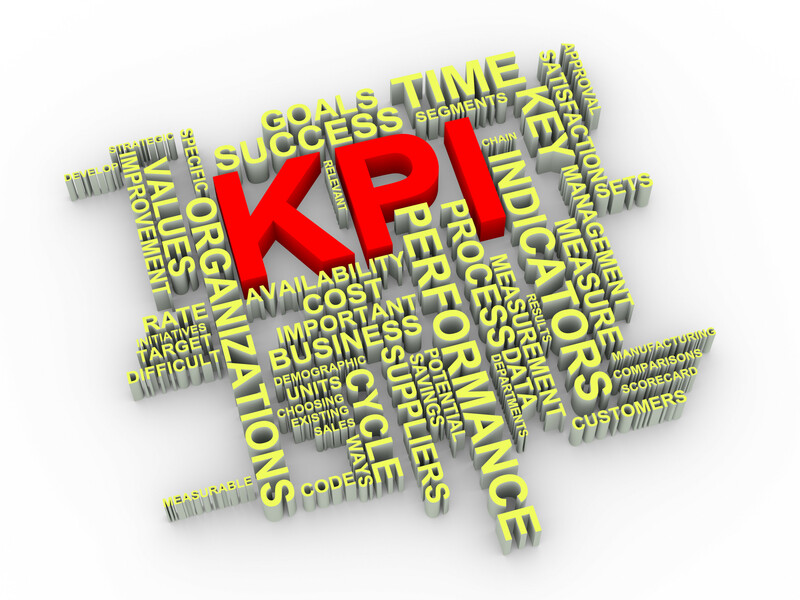 Which of the following time based Key Performance Indicators (KPIs) are being tracked in your company? Where you are capturing this data, are you using “averages” to drive improvement? The statistic commonly used for countless performance metrics, averages are easy to compute and understand. Intuitively, people trust that changes in the average reflect real changes in performance. When computed over a long-enough time period, averages become immune to “fluke” results. And as long as the flukes are truly rare and most results are within a relatively narrow, symmetrical band, the average does a reasonably good job of reflecting performance capability. So is there a problem with this approach? The good results can only be so good; the bad results can be horrid. Once the timer starts ticking, you can’t get better than 0. On the other hand, there are plenty of circumstances that can delay the process for a long time. There is no way to make a “good” reading balance out a “bad” reading; it takes many good readings to do so. (This is the phenomenon otherwise known as “One aw-s$%t cancels a hundred atta-boys.”) The distribution is asymmetrical: heavy on the fast end with a tail on the slow end. Instead of one big symmetrical bundle, we get “clusters” of data. 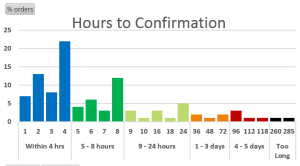 While the customer is getting frustrated, time is flying by and we measure it in intervals: same day, 1-3 days, 4-7 days, 1-2 weeks, and so on. Everyone knows it’s “bad” to run into the wall between intervals and throw the issue into the next time bucket, so there will be a rush to wrap things at the last minute. The result is a “multi-modal” distribution with more than 1 hump and a tail, like the back of a very odd camel. Even some “bad” results are justifiable. What if we need input from the customer before we can respond and the customer doesn’t get around to sending it? What if a request requires investigation into a new raw material, a new method, a new procedure? What if an out-of-the-ordinary concern is raised at the end of the day, just before a weekend or holiday? It doesn’t seem fair to include those cases in the data, but not including them requires a defined logic and management time for handling exceptions. Soon the measurement process itself becomes cumbersome and there is growing incentive to identify new exceptions rather than focus on process improvement. This isn’t a productive use of management time. Sadly, using the average in these situations will typically generate more heat than light. It doesn’t reflect the good work being done at the “fast” end, and it will put unproductive focus on the “humps” slowing things down. Furthermore, as the data set grows, getting the average to move gets harder. Finally, the average rarely reflects real customer experience… and that is what should matter most! 2% taking longer than 5 days. 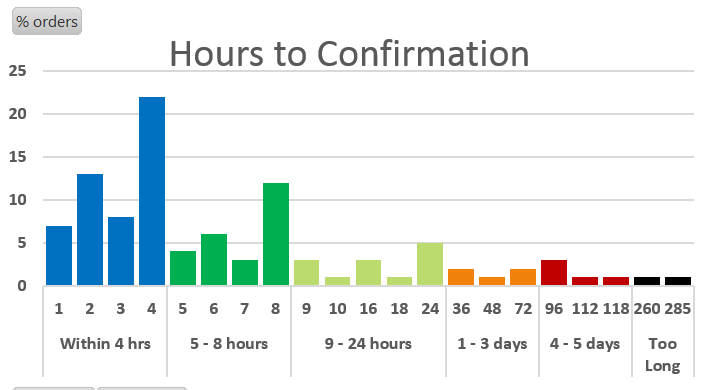 No more than 2% of orders will require more than 3 days for confirmation. This approach puts greater focus on improving the processes where it matters most while recognizing that not all orders can be handled at the same speed. The target ‘allows’ for exceptions that put some orders on a slower track, as long as “legendary failure” is avoided. This kind of improvement really does make a difference to customers, and the trend is easy to track. The percentage of cases that must meet the target can be pushed up. Instead of hitting the target 4 times out of 5 (an 80% success rate), push for an 85% or 90% success rate. The target itself can be strengthened: e.g., aim for confirmation in 3 hours or less. Most companies have created management dashboards that are designed to keep the critical KPI’s in focus. But, if the the dashboards aren’t populated with the right metrics the result will be less than satisfactory, frustrating everyone in the organization and not delivering the performance improvements that are critical to you success. Talk with Group50’s Performance Management Consultants about the time based key performance indicators and targets you are setting and the best way to use your targets to drive performance improvement that matters. We offer experience, objectivity, and facilitation skill to help “middle market” firms tighten up on strategy, improve operational execution, and drive better performance.